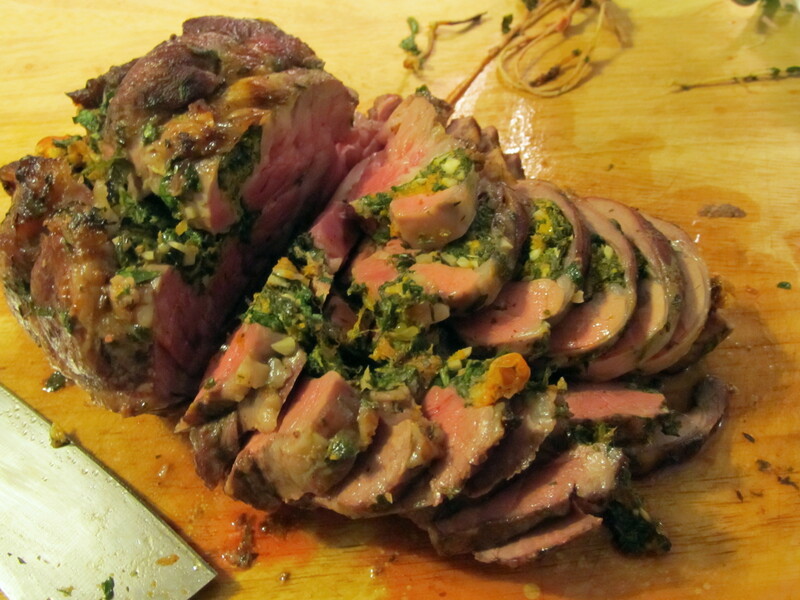 So remember a few posts back how I said I always make a leg of lamb for Easter? (No? Well go back a few and get caught up!) Since we were traveling I didn’t get to cook Easter dinner. However, upon returning to Chicago I noticed ham and lamb were both on sale. Imagine that. It was kind of like buying wrapping paper on December 26. Very nice. They didn’t have any full lamb legs but there were plenty of 3-4 lb shanks and shoulders to be bought. Prices being what they were I picked up a nice little piece of lamb (and some ham) which I intended to make for Sunday dinner. And since this past Sunday was Orthodox Easter it turns out I did make lamb on Easter! Lamb has always been pretty popular with my family, on all sides actually. 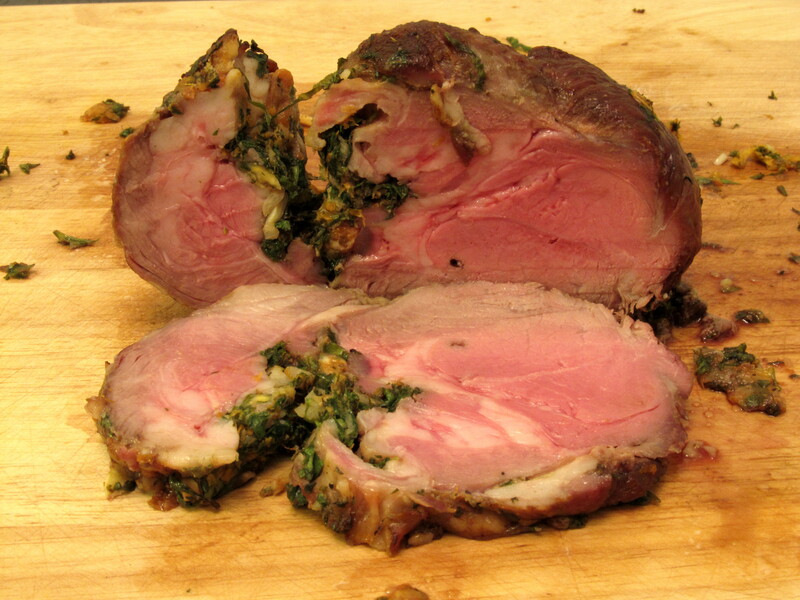 My mom always says roast leg of lamb was my grandfather’s favorite dinner. My step-mom loved it too. Lucky for me everyone will eat it but also unlucky for me everyone likes it. Not many leftovers! Normally I just get a whole 6-7 lb leg and roast it but since I just had a small one I figured I’d just de-bone, stuff with some herbs and roll it up. De-boning can be pretty easy if you have a sharp knife and just work your way along the bone. 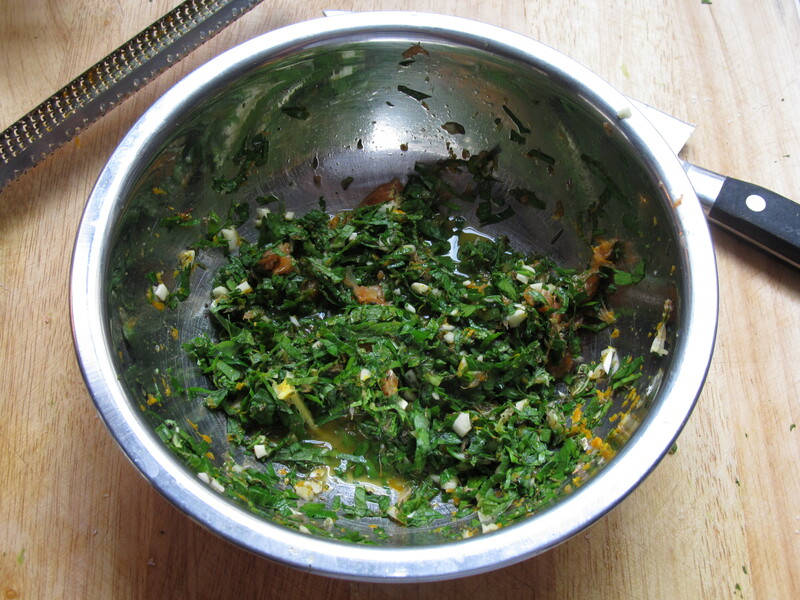 Cut and scrape, pop the bone out, spread the mixture on the inside, roll up and tie. You can also buy one that’s already been boned if you’re unsure of your knife skills. The nice thing about such a smaller piece of lamb is it cooks pretty quickly in the oven. This one took about an hour to get to 135°F on the thermometer and came out so juicy and tender. I let it rest while grilling some vegetables and making a sauce. You can make a sauce for this or not, but there’s nothing wrong with the old stand-by of mint jelly if that’s what you like! Combine all ingredients in bowl and mix well. 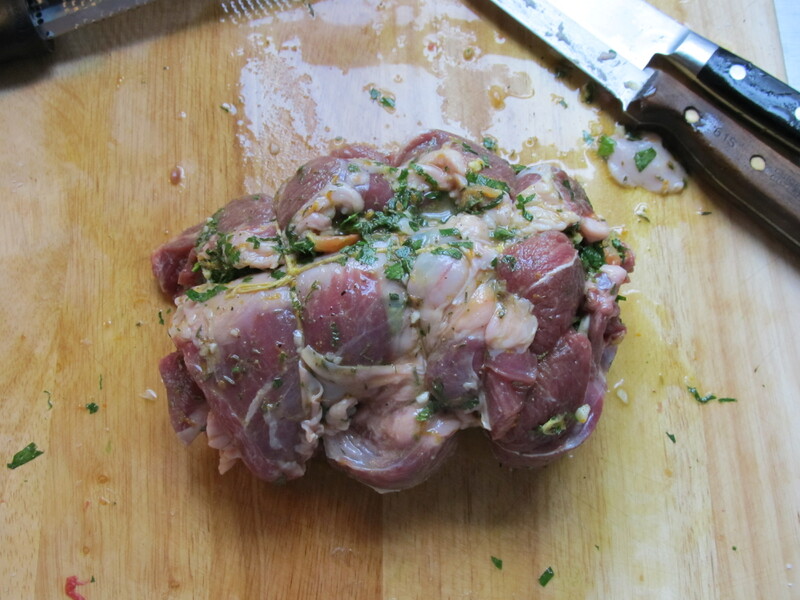 Adjust seasonings, spread over the inside of the lamb and work it into any cavities. Roll back into a leg shape and tie with some kitchen string to keep the roast together. Place in roasting pan and cook at 450°F for 15 minutes. Reduce to 350°F and cook for another 45-60 minutes or until thermometer reads 135°F. If you don’t have one of those digital thermometers figure about 20-25 mins. per pound for med -rare depending on your oven. Do yourself a favor and just get one of those thermometers. When done remove from pan and allow to rest while you make the sauce. Slice the lamb, spoon sauce over, and serve. Come on, admit it, that's pretty damn near perfect! Previous Post White Sox Home Opener on the Southside! Well thank you! That must explain my reverence for this particular cut of meat and instinctual ability to cook lamb since I’ve got some Welsh lineage in me on my mom’s side. Must. Have. Now. If I lived in Chicago I’d likely stalk you and beg you to invite me over for this. Aren’t you glad I live in New York. Ha! Um yes. I don’t want to tempt you even more but this was really good. Probably one of the best roast lamb I’ve ever cooked.